Replies: 110 (Who? ), Viewed: 48292 times. Something to join in the meshing tutorial frenzy, as cocomama has motivated us all to collaborate together with one goal in mind - A complete and comprehensive Meshing tutorial! yay! Go us. Bear in mind I'm still new at meshing, so if there are errors or inconsistencies - do let me know. If you want to see certain sections, or improvements on other sections, e.g for the FAQ to go into its own file, etc. Maybe the narrative is too long (tl;dr; ?!?!) or it is too graphic-intensive? I applied it to myself as I wrote this as I hated to read documents where it tells me to do such and such but never explained why that setting was chosen or why those options were applied. Do review and please provide feedback, suggestions and corrections. Criticisms also welcome. This tutorial takes you step-by-step through the process of creating a new table mesh from the original on the left (the 'Sunup Breakfast Table' named TableDiningQuaint) to the final outcome on the right. Primarily, this is to document my own experiences in the meshing process, with highlighted areas where I had difficulties, how I solved them or where the solutions could be found. It's main function was to be an offline repository for when my internet connection is down (and I'd just have to have that missing info - like right nao!) and as reference when I take a break and come back to meshing a few months later and would have forgotten things. Also, with all the threads asking the same questions on the forums over and over again, I thought I’d pretty it up and contribute and share with the community. Where possible, I’ve included the threadIDs when bits of pertinent information is first referenced, from the Meshing and Modding subforums of Sims 3 Creation and tutorials in Sims2Wiki. Bear in mind the tools are still being developed and evolving, so screenshots may change. I also take no responsibility if installing the utilities listed and modding/meshing resulted in a BFBVFS in your game, messed up your game (because you’ll be testing with adding/removing CC), render your computer unusable, messed up your head when you get nightmares of being chased by squabling dining tables each claiming they are the original and am “The One”. Read Wes’ 3D Meshing tutorials – this is a MUST – these tutorials will explain all the concept and background material on Milkshape, UV mapping, etc. and last but not least Delphy and the MTS admins/moderators for creating and maintaining MTS. It's page 11, Section E.2, step 3. ... - in the tutorial it says "IMD", but it was actually "IMG". This tutorial has now been wiki-fied! Any new information as the tools are updated or when I decide to update it with more sections, will be in this Tutorials:TS3_Basic_HowTo_Mesh_Guidewiki. Wow that looks like some amazing hard work! Thank you for doing this. Must have taken a lot of time. Oh, bless your heart! If this is what I think it is, it's exactly what I need! I keep reading through tutorials and coming to parts that are either completely irrelevant or don't explain in nearly enough detail what I need. One of my mom's favorite questions for me was, "Do I need to draw you a picture?" I never had the guts to answer her but the truth of the matter was, the answer was "YES!! I need pictures, and lots of them!" I have never learned how to mesh, and it's something I have been wanting to do for a long, long time. Oh ellacharm3d, its beautifull and so detailed!! Its way past bedtime here, but I had to quickly read through it. I haven't looked at it yet, but if this is what I think it is...I'll give meshing for Sims 3 a try. I've been waiting for a tut like this,what tells you exactly step by step. Strong work Ella...a much needed addition to the tutorials for Sims 3 IMO. Ooo...and if you get the chance...could you update the Glass tutorial PDF's? I added a small warning at the beginning about the bones issue that gave so many of us trouble when trying to apply glass to original meshes. I'm curious what elaboration you think is necessary...I'm always interested in honing my tutorial building skills and it would help to know what you think is missing. #10 22nd Oct 2009 at 5:53 AM Last edited by orangemittens : 22nd Oct 2009 at 6:05 AM. Ella I look forward to seeing your comments once you have read the tutorial and tried it out. I guess I'm not clear on what you're saying...are you saying you think my tutorial needs editing and that you plan on doing this editing? I can't open your files zipped. I'm right now at work and the secyrity is perhaps very high. I don't know. I'll try later. Hi Ella, me too, I've been trying to open it to no avail. I downloaded all the parts many times over (it seems to go ok) but when I click part 1, I get an error message and only one picture. MTS renames the files that are uploaded, so the unzipping app can't find the next file to process. Try deleting the first part of the filenames (so that it matches the ones written in the post). Oh! Sorry, I forgot that part, didn't I? It is because of the numbering appended to the filename at the beginning; the WinRAR program is looking for files of the same name. Once you've finished downloading, remove the "MTS_ellacharm3d_?????? ?_" and extract part 1 again. I'll add this to the instructions, thanks for letting me know, guys. I am just starting to read through the tutorial, and the following brings up a question. It was my understanding that Milkshape is the only meshing program that has the ability for converting meshes to GEOMs (thanks to Wes's plug-in), but that information sounds like there are possibly other programs that will work. Did I miss something? I would absolutely love to have the time to learn how to properly do this with a program where I'm not either on a time limit, or have to purchase to see if I possibly can make it all the way through the learning process. If I'm successful, I have no problem buying a license for MilkShape, but I am a very slow learner. As an aside, I don't think I'd consider PSP to be a "costly" image editing program. Granted, there are now free ones available like GIMP and Paint.NET, but PSP can often be purchased for under $50, compared to PhotoShop which usually has a price tag of over $600. BTW, I don't think I can express enough thanks for all of the work you put into putting this together. I have written tutorials and know how time-consuming and nerve-racking they are to put together. Thank you, again! You need milkshape bcos that's the only one that has plugins (for now) for object meshes (I think Wes is working on a Maya plugin, too) There is a GEOM plugin for Blender by Morgade but I haven't tried that. (It is harder to learn Blender than to pick up ms3d, but I'm slowly trying). Once in ms3d, you can save as any file that your other modeling program can open/import. I know some people use ms3d as a "bridge" only. Know nothing abt PSP, to be honest, so I don't know how feature-rich the free version is versus the paid one, I just put it out there for wider coverage. I just hate to be needing a tool and then a dialog pop-up telling me it is only for the paid version. The complete list, as I know it, is MilkShape using my plugins and a set from the TSR Workshop (I am not sure is they are completely finished with it), and GEOM only plugins for Blender (by Morgade) and for Maya (by me). Morgade has not been around, I was hoping he would take on the Blender object plugins, we talked about it, but he is doing other things, I guess. Many of the other programs mentioned, like Wings and 3DS Max, can work using the TSR Workshop and their .obj importer/exporter, or by using my tools and MilkShape as a file converter. Note that .obj format does not support bone assignments, so that step still needs done for most objects. As we have seen. I know a lot of people would like free choices to work with, but the mainstays of the free software world, Blender, Wings and Anim8or are all much harder to implement plugins or extensions to than MilkShape. fragMotion and Maya are also difficult to work with, and I don't own 3DS Max, so I can't work with it. Free is always nice, but I don't mind paying for software if I know it's something that I will use. I don't have a problem with paying for a license for MilkShape, but I do so hate feeling like I'm under the gun with the time-frame of learning what I need to learn with it. Thirty days trial is probably long enough for most people, but I'm not so sure it's long enough for me. And believe me, I do very much appreciate that there are plug-ins available at all. A complete, licensed version of PSP usually runs in the neighborhood of $50 to $80, depending on the version. The processes are laid out a bit differently, but in my eight years of using it, and following PhotoShop tutorials for a good amount of the things I've done in PSP there's very little difference in the two programs. Someone who had experience with both programs at one point made a comparison. Their opinion was that if a person needs an image editing program for extremely professional presentations, then PhotoShop was the way to go. For making Sims content, Paint Shop Pro will do everything that needs to be done. Granted, with every new Sims game there have been new techniques to learn in PSP, but while the method is slightly different in PSP than in PS, the tools are there to do the job, and usually for a price of roughly 10% of what PS runs. I declare, the more I read on the subject of meshing, the more questions start popping up in my fron. I barely had time to glance at Ella's tutorial today, but have to say it looks awesome, and in just the short section I got to look at already answered some questions and pointed to the answers to more of them that I've been trying to find answers to for a good long while now. I love this tutorial as it goes so indepth, the only problem for me is the same one as all the others. The milkshape part. 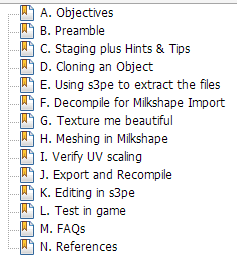 It says import to milkshape, ok so which to import first? do we import them all at the same time? Or do we work on one then save and work on the next? Everyone seems to skip over a lot of the milkshappe stuff and that's where mine and probably a lot of others are having problmes, never having used milkshape before. Everyone seems to skip over the same basic milkshape stuff like importing, I know the tools but not the correct file to use first or which order I should do them in if there are say 4. Do it one by one. Just like you decompile one at a time - so, mesh one at a time and recompile one at a time. I always work on the main one first - the all 0s one. Then reduce the poly count by deleting unimportant bits or via the directx tool for the others. Think of them this way - they are quadruplets (a set of 4 twins/offspring) - you can only dress them one at a time, not all 4 at once (unless you're an octopus ). They are not a single entity, just a set of four that likes to go everywhere together. Glad it is helping people..I almost chucked it bcos it grew a life of its own and became so big! ...start with building a working "00000000" MLOD file. After you have that UV mapped, tested and are happy you use the mesh from it to make your "00000001" mesh. (=MODL) That mesh is a same-sized but reduced poly count version. The MLOD files have everything to do with sunshadows. The MODL is usually group "00000001" (lod1) and it pairs with "00010001" for it's sun shadow. The other lod0 (main) file will be group "00000000" and it pairs with "00010000" for its sunshadow. But the sunshadow mesh is not the shadow, it is the other half of some sort of template the game uses to make a sunshadow by calculation... as the sun moves, the shadow changes, whereas the dropshadow stays the same. 1. Make the MLOD 00000000, mesh texture UVmap and export/save that one. Thank you! Especially for the UV-Map part. I'm learning to mesh for three weeks now, read every tutorial, read in the forum and there are so much things I don't know yet. When I tried to expand the file, my expander says its broken. What? ?